Boykin is an excellent nickel corner with long arms and great hops. He has been great value for the Eagles, playing on his rookie contract; the guy had six interceptions in 2013, but saw a major drop off last season. Was it because his play dropped off, or because teams were scared to challenge him over the middle? Statistics can’t answer that question, but there is a third possibility to keep in mind: there was no need to challenge him because the Eagles outside corners were so terrible last year. Opponents just threw long against the outside corners for easy touchdowns, over and over, especially during the three-game losing streak toward the end of the season that eliminated them from playoff contention. In any case, Boykins’ rookie contract expires at the end of this upcoming season, and he made it clear that he wouldn’t re-sign unless he was moved to outside cornerback, a position with more visibility and a higher average salary. The problem is that he’s only 5’9″ at a time when teams are drafting big outside receivers. Receivers range from 5’11” to 6’5″, and Chip Kelly just doesn’t like starting out at a physical disadvantage like that of Boykin. It’s a tough situation with no easy solution; there’s a whole chapter (“The Boy King Dilemma”) about it in my new book “Controlled Chaos.” As great as Boykin is, it’s hard to imagine him successfully defending receivers such as the Dallas Cowboys‘ Dez Bryant (6’2″ and pretty good at jumping himself). 15,000 – 20,000 fans attended open practice on August 4th. So the Eagles traded Boykin for a mid-round pick. They lost one year of a great player, but he was going to walk away at the end of the season and the Birds would have received nothing in return. After all of Chip Kelly‘s hyperactive horse-trading, this is a very different team that lost its best quarterback, wide receiver and running back, as well as both starting guards and a lot of crappy defensive backs. They were replaced by a strong corps of WRs and RBs, a high-risk, high-ceiling quarterback in Sam Bradford and several “he might work” guards — placeholders until the team can find long-term solutions. The team also added six DBs. Expensive free agent Byron Maxwell looks solid, and returning safety Malcolm Jenkins is a perfect system fit. The rest are ”he might work” types, except these are mostly young players who could blossom into multi-year starters. Ballhawk JaCorey Shepherd is already penciled in to replace Boykin at nickel CB, and injury-prone former Oregon CB Walter Thurmond is moving to safety (for the first time ever) to fill the hole there. The second CB position is a battle between veteran Nolan Carroll and rookie Eric Rowe (out of Utah). Right now, there are six starting positions with unproven players — the second safety, outside and nickel cornerback, both guards and QB. Bradford is still recovering from his second ACL tear in two years, yet his performance so far in training camp demonstrates why Kelly traded for him. He gets the ball out quickly, places it beautifully all over the field, and is mobile. Critics cite the risk of reinjury (10-12% according to an outside expert the team brought in), but I’m more concerned about his psychology after two season-ending injuries. Will he be able to stand tall in the pocket facing the NFL’s brutal pass rushers? Nick Foles seemed to lose his nerve last year over the summer without any triggering incident at all. 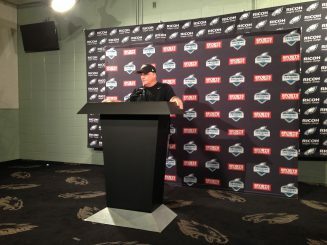 Chip Kelly’s press conference on Tuesday. Beyond those question marks, the team is rock solid, especially across the defensive front. Kiko Alonso was a great addition at inside linebacker; his playmaking and pass coverage ability should cure the team’s severe weakness on 3rd-and-long over the last two years. The front line was already great and young, ranking second in the league in sacks last year, and Alonso’s addition turned the last remaining weak spot into a strength. Even if the secondary turns out to be average, this should be a very stingy defense. Add another year to build and it could be a famously tough unit. With all the new pieces, this team may take some time to gel, and problems with Bradford could make this a very long season for offensive coordinator Pat Shurmur. This year, “offensive guru” Chip Kelly may have a team like the Seattle Seahawks, which doesn’t score a lot, but doesn’t really need to. With what many are calling the best trio of running backs in the league — Demarco Murray, Ryan Mathews and Darren Sproles — and former Duck Josh Huff looking great in training camp, a rusty Bradford, Mark Sanchez or even Tim Tebow may be able to score enough points to win.